Round 16 of the 2018 AFL Season kicks off Thursday night Sydney time at Etihad Stadium with the Sydney Swans hosting Geelong at the SCG. The full broadcast schedule for the round can be seen below. In addition to the TV networks you can also subscribe to the Watch AFL service that will give you live access to all the matches and more (outside Australia only). 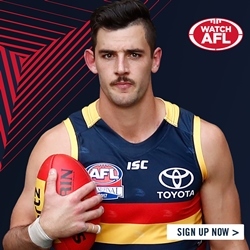 You can access that service by clicking on the link here or the Watch AFL promo shot on the left to register and by then paying the subscription fee. Right now Watch AFL is offering a Mid-Season Pass a big discount on the regular season pass. This pass includes all AFL Premiership season matches, the Finals Series plus access to FOX FOOTY content.